Who can forget Russ Kane and his little blue plane waking up London? ‘Russ-Boy’ as Chris Tarrant affectionately called him, was the morning voice of Capital FM’s ‘Flying Eye’ traffic-spotter plane for 20 years, as part of the behemoth Chris Tarrant Breakfast show. It was the most listened-to commercial radio show in the world, with an audience in excess of 4 million. However, life was not without tragedy for the on-air joker – whose wife died from cancer when their twins were just 5-years-old – making him rethink his life. Russ has kept his hand in on air – joining BBC Radio London where his weekly, news reviews have earned a loyal following and on TalkRadio, where his Midweek Music Review is a much-anticipated highlight of Paul Ross’ Breakfast Show. 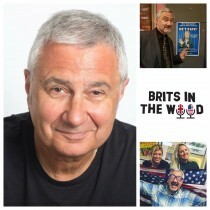 He’s also had a great career in advertising, owned a music management company, has just written a novel and has been performing his hit comedy show: ‘Kaned Laughter’ on both sides of the Atlantic. In the words of Storme Warren himself, Brown & Gray – the collaboration between Kaci Brown and Sam Gray, serves as a bridge between the soul of country music in the US to the new boom of country in the United Kingdom. 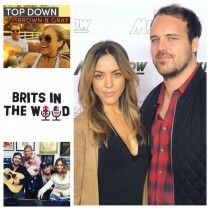 Building a link between the US and the exploding country music scene in the UK, this exciting project is just the beginning of a creative journey through the best both worlds have to offer, with the new single “Top Down” leading the way. She recently survived a month living wild in Bear Gryll’s Celebrity Island (C4) – which, she says, was no laughing matter. 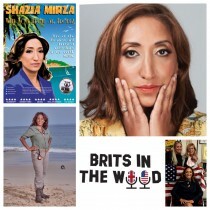 Comedian Shazia Mirza is a regular face on TV in the UK – appearing on The Jonathan Ross Show (ITV), Graham Norton (BBC), Top Gear (BBC), Loose Women (ITV), The Late Late Show (RTE), and she is a regular panelist on The Wright Stuff (Channel 5). However, growing up in Birmingham with strict Pakistani parents nearly saw Shazia’s career take a different turn. Her family hoped she’d be a doctor or a lawyer – and she reluctantly got a degree in biochemistry and became a science teacher. But her dream of being on stage led her to take comedy-writing classes at night and she began performing at small clubs around London. A few weeks after the September 11 attacks on the World Trade Center, she got on stage wearing her hijab, and started off her act: “My name is Shazia Mirza… at least that’s what it says on my pilot’s licence…” After that night, Mirza’s comedy career took off. She was profiled on “60 Minutes,” was a semifinalist on Last Comic Standing and started performing to packed audiences all over the world. In the latest Brits In The Wood episode, Shazia chats exclusively to Caroline Feraday and Claire Bullivant. Seann Walsh is a regular face on British TV. You’ll have seen him on Saturday night’s sports panel show Play To The Whistle and as team captain on comedy quiz show Virtually Famous. Other recent TV appearances include Live At The Apollo, the Jonathan Ross Show, Tonight at The London Palladium, Channel 4’s 8 Out Of 10 Cats Does Countdown, Alan Carr: Chatty Man and Russell Howards Stand Up Central. This guy is everywhere! But there’s good reason for it. For however disheveled he may be, the Foster’s Comedy Award nominee is also one of the hottest comics in the UK right now and also taking America by storm. Last week Seann made his big debut on America’s popular late night talk show Conan O’Brien. Not bad for having only been in the country for a week! With a keen observational mind, Seann Walsh can spot the absurdity in everything and convert it to perfectly delivered stand-up comedy. You might have seen Seann on TV, but he’s something else live – pacing the stage, working the room and reducing crowds to hysterics. Even if he’d probably rather be at home watching Sky Sports News. 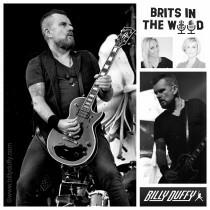 In his 40 years in music, Cult guitarist and songwriting virtuoso Billy Duffy has played with the best – Morrissey, Jagger, Iggy et al. However, it was teaming up with Ian Astbury that launched The Cult into the rock stratosphere hall of fame. With Billy’s songwriting skills and guitar wizardry The Cult enjoyed a streak of huge hits such as ‘She Sells Sanctuary’ and ‘Rain’ before calling it quits in the mid-90s and regrouping in the new millennium. Billy’s road to rock-stardom is interesting… growing up in Manchester in the seventies, Billy was friends with a teenage Steven Morrissey – who would go on to be that Morrissey. In fact, it was Billy who introduced Jonny Marr to Morrissey who went on to form The Smiths.